Being pregnant during the hot summer months is a double whammy for mamas-to-be with sweet cravings. Not only is it hot and uncomfortable to carry around that little babe in the oh so hot summertime but there's frosty, high calorie, sugary treats at every turn. Milkshakes, ice cream, soda slushees and other icy treats beckon, but you know you should say no. Bummer. Or not! 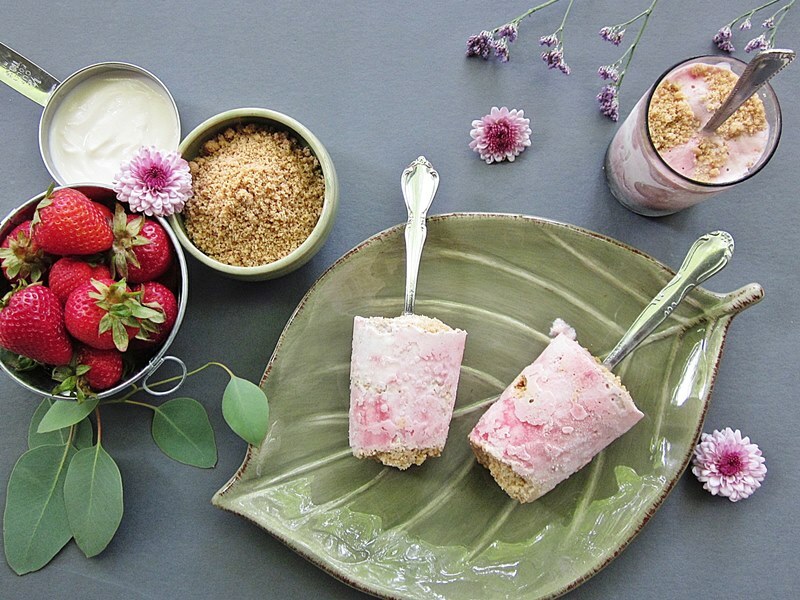 Below, we've got a slew of sweet treats that won't totally spike your blood sugar, that don't contain any unhealthy additives, or increase your pregnancy mass to undesirable levels, but they will still satisfy a sweet summertime pregnancy craving with aplomb. There are any number of delicious smoothies you can make during pregnancy that are healthy, low-fat and icy cold, but the key to this extra perfectly refreshing (and dairy-free) smoothie is frozen bananas, two kinds of berries and coconut water. Easy, fast and a great way to kick off your day with a hint of healthy sweetness. 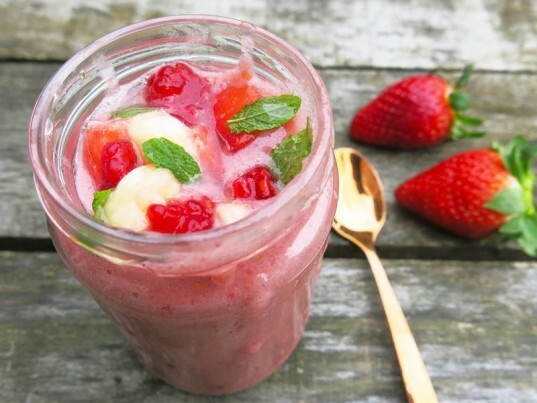 Need other smoothie ideas? 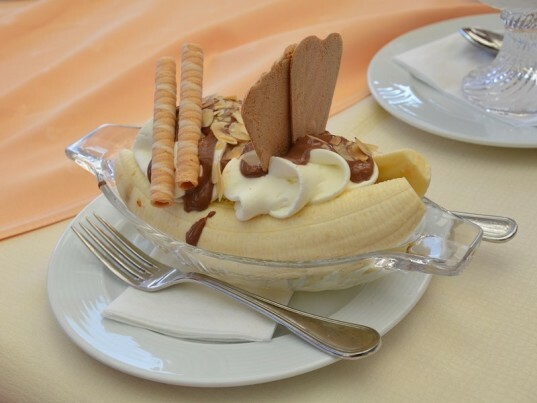 You don’t need an indulgent banana split (like the one shown above) to handle your craving. This dessert is easily lightened up with just a few simple changes. First, keep the banana, but top them with healthier options, such as replace your ice cream with fat-free frozen yogurt, replace the syrup with pureed fruits with a touch of agave or lemon juice, and sprinkle on some dark chocolate shavings or dark chocolate chips. Don’t forget the cherries! If you need a crumble on top to make this all feel real, try these non-fat ginger snaps. Also check out this healthy breakfast banana split or this cute banana split in a jar. Finish off those summer barbecues with a healthy sweet treat fit for a pregnant mama (or anyone). Angel food cake is sweet and low-fat, plus you can top it with excellent icy cold toppings such as low-fat frozen yogurt, frozen berries or even a sprinkle of frozen dark chocolate shavings. Healthy cake plus frozen accompaniments! Perfect for summer evenings. Blueberries are a powerhouse superfood packed with antioxidants, Vitamin C, Vitamin K and manganese. So eating a bowlful is a-ok, but why not turn those purple berries into a delicious mousse tartlet?! This recipe, inspired by the classic children’s book, James and the Giant Peach, will get you in a parenting mood and cool you off. Peaches, creamy by nature, are perfect for making ice cream, plus when paired with a vegan cashew base, the peaches make a luscious sweet treat that is healthy and takes barely any prep, so you can be licking your ice cream in no time flat. This impressive treat will satisfy all your chocolate cravings but with a healthier twist than traditional chocolate pudding. Avocado, the star of this healthy dessert, is packed with potassium to help fend off pregnancy leg cramps, but we promise, the cacao powder masks the avocado beautifully. All you’ll taste is chocolate goodness! 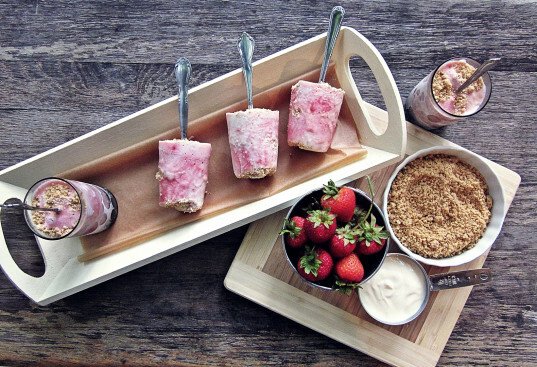 Go ahead and garnish your pudding with fresh or frozen fruit or coconut flakes and enjoy chilled. You don't need an indulgent banana split (like the one shown above) to handle your craving. This dessert is easily lightened up with just a few simple changes. First, keep the banana, but top them with healthier options, such as replace your ice cream with fat-free frozen yogurt, replace the syrup with pureed fruits with a touch of agave or lemon juice, and sprinkle on some dark chocolate shavings or dark chocolate chips. Don't forget the cherries! If you need a crumble on top to make this all feel real, try these non-fat ginger snaps. Also check out this healthy breakfast banana split or this cute banana split in a jar. 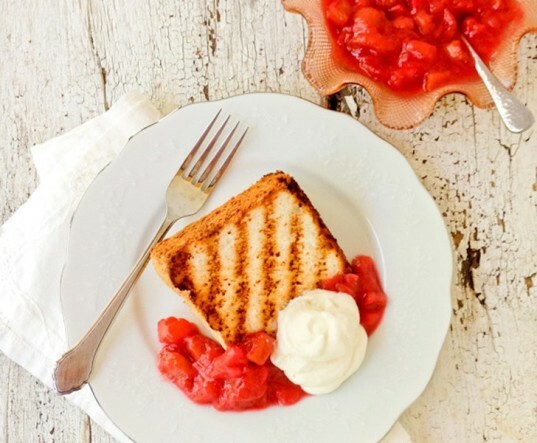 Image via A Farmgirl's Dabbles Grilled Angel food cake & rhubarb sauce Finish off those summer barbecues with a healthy sweet treat fit for a pregnant mama (or anyone). Angel food cake is sweet and low-fat, plus you can top it with excellent icy cold toppings such as low-fat frozen yogurt, frozen berries or even a sprinkle of frozen dark chocolate shavings. Healthy cake plus frozen accompaniments! Perfect for summer evenings. Raw blueberry mousse tartlets Blueberries are a powerhouse superfood packed with antioxidants, Vitamin C, Vitamin K and Manganese. 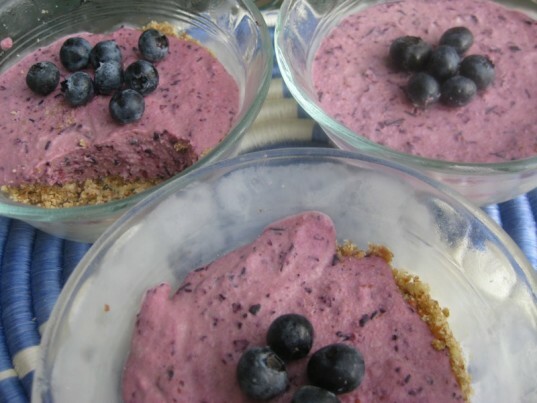 So eating a bowlful is a-ok, but why not turn those purple berries into a delicious mousse tartlet?! This recipe, inspired by the classic children's book, James and the Giant Peach, will get you in a parenting mood and cool you off. 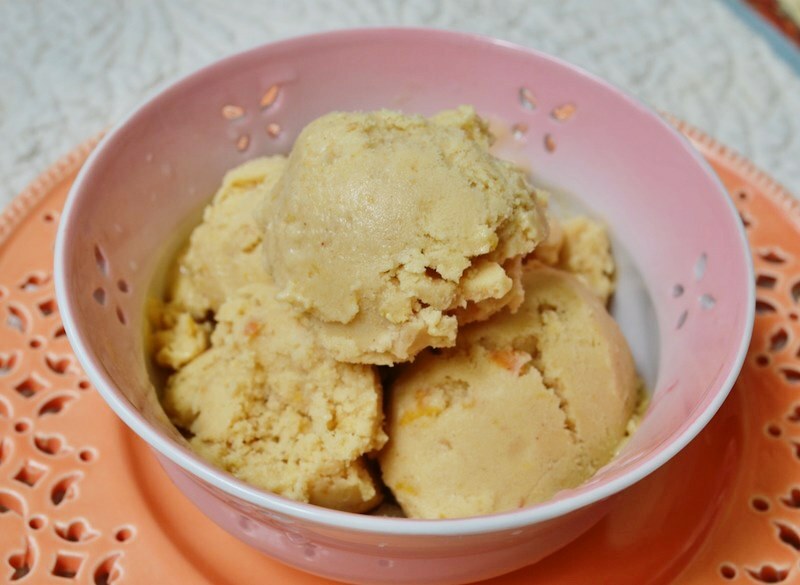 Peaches, creamy by nature, are perfect for making ice cream, plus when paired with a vegan cashew base, the peaches make a luscious sweet treat that is healthy and takes barely any prep, so you can be licking your ice cream in no time flat. 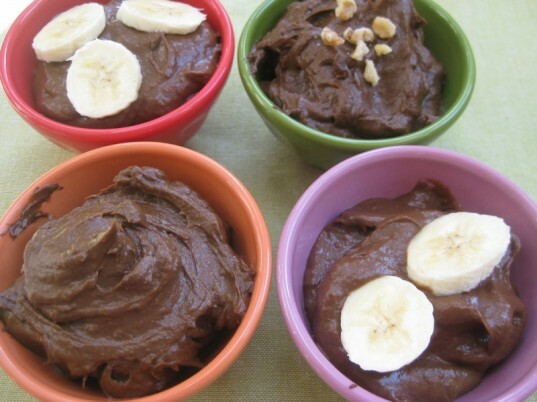 Vegan & gluten-free avocado chocolate pudding This impressive treat will satisfy all your chocolate cravings but with a healthier twist than traditional chocolate pudding. Avocado, the star of this healthy dessert, is packed with potassium to help fend off pregnancy leg cramps, but we promise, the cacao powder masks the avocado beautifully. All you'll taste is chocolate goodness! Go ahead and garnish your pudding with fresh or frozen fruit or coconut flakes and enjoy chilled.